You can count on Setter Play for creating playground equipment for nursery children. We incorporate aspects of play with education, making learning fun! At Setter Play, we have equipment that offers excitement for a range of children, whether it be our ramps and ropes or towers and climbing frames, you’re sure to discover something that suits the space you have available, as well as providing challenges in the form of obstacles. If you want to create a centrepiece for your school playground, Setter Play provides fundamental equipment that is eye-catching, which is perfect for inspiring young minds and capturing their imagination. An example of our fundamental wooden playground equipment includes the Tugboat. This piece of equipment grabs the attention of children due to its influential presence and the use of bright colours! Not only can children embrace their creativity, they can improve their physical strength by climbing, supporting their own body weight when using the ladder ropes. Do you want equipment that is safe? 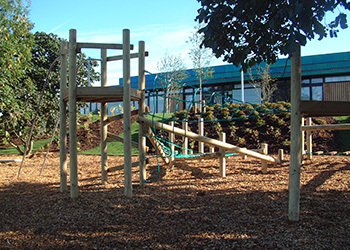 Setter Play manufacture wooden playground equipment for infant play areas; we use wooden materials to not only enhance the appearance of the play area but to ensure children are safe from harm and injury. All our equipment is made to have smooth edges, preventing scratches and scrapes from sharp corners! With this said, you want your playground equipment to be presentable and exciting to attract children’s interest! So, if you’ve got limited space available, and a tight budget, you need to look further than Setter Play, as our playground equipment is extremely affordable!